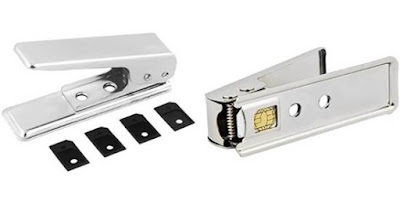 Nowadays new smartphones are coming with either Micro SIM slot or nano SIM slot which requires the smartphone users to swap or cut their normal SIM into Micro or Nano SIM. Method 1 and 3 is applicable to all Networks. Smart SIM option is available for only few networks. Go to any mobile service center. Even a small cell phone service center will provide this service. Tell them whether you need to convert your SIM into Micro SIM or Nano SIM. Only Apple iPhones require nano SIM . All other latest smartphones need Micro SIM. They will have a ready-made micro / nano SIM cutter which looks similar to a classic punching machine. The service person will place the SIM in the respective die and cut your SIM into Micro or Nano SIM within a few seconds. You can now happily put your Micro or Nano SIM into your new Smartphone and start using it as usual. Method 2: New Smart SIM card request. Nowadays Airtel started to provided Smart SIM option on request. Smart SIM consists of the card holder which consists of a nano Sized sim and additional extension adapters of Micro SIM and normal SIM. You can easily swap into any size just by attaching or detaching the suitable extensions. The new Airtel Smart SIM card can be requested in all Airtel Showrooms and service centres. The Smart SIM may cost few rupees based on the network. A risky non-recommended method . Because it requires high artistic skill . A slight deviation would result in damage of the SIM card. You have to download the template of Micro or nano SIM in original scale and take a print out. Mark it in your SIM card and cut using appropriate scissors to get your required SIM size.